Autumn has continued to bring mainly drier than average conditions for most parts of the country, and nights are beginning to get cooler with some parts of the South Island getting below zero degree over the weekend. The West Coast of the South Island received huge amounts of rain, with up to 1000mm recorded at one weather station. Rain to other areas has been patchy, parts of Canterbury have received some rainfall which has helped pasture levels with winter looming although others are still desperate. Showers and morning dews are helping keep many North Island regions green although most need more rain to maximise pasture levels into winter. 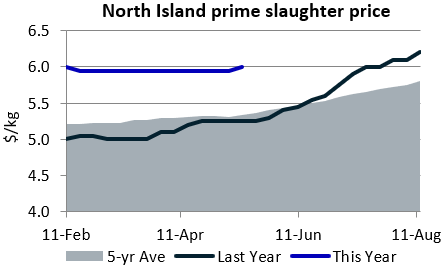 With finished bulls becoming hard to find in the North Island, processors were forced to lift bull schedules with most now receiving $5.00/kg to keep supply coming in. Cow continues to flow in although the mad rush seems to be over. 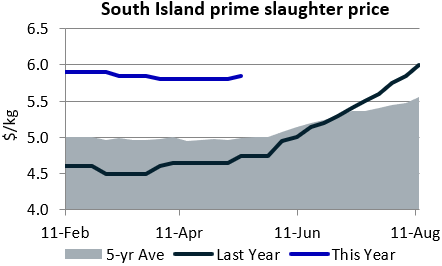 Prices are varied through the country with regions such as the Bay of Plenty and Northland in particular still very dry which may keep prices soft as supply of cull cows continue to come in. Wait times to get stock killed are generally within a week to ten days although backlogs may build with short weeks with Easter and ANZAC day coming up. This time last year the US market found itself awash with beef. When US end users began to actively seek out manufacturing beef at the end of last year, they discovered they have had to compete with the Chinese market. A lot more of New Zealand and Australia’s beef exports are heading to China which is proving to be a more stable market with less volatility of the US demand. US imported beef prices are performing well at present due to the strong demand as the US looks to build inventories prior to the grilling season. 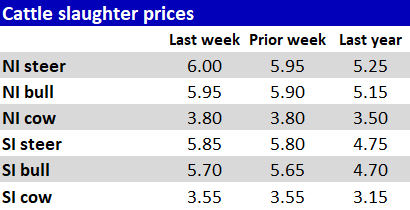 Prices are sitting at US$2.14/lb for 90CL and US$2.26/lb for 95CL, which is 50-50c/kg above year-on-year in NZ terms. Apply for livestock finance online or even over the phone and we'll have an answer in seconds. Lamb supply has eased as farmers get to the end of their supply. 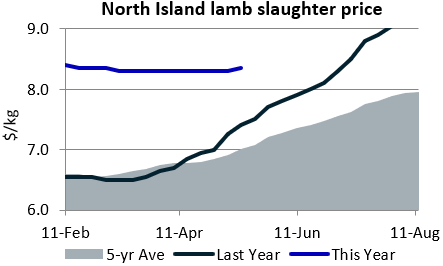 This has pushed lamb prices upward slightly in the south at the top end with the range now $6.60-$6.90/kg, and in the north to $7.00-$7.30/kg. While it is early for chains to be shifting into ‘winter mode’ there are some chains running only 3-4 days a week. Like cattle, space may get tighter over the next couple weeks with Easter bringing shortened killing weeks. 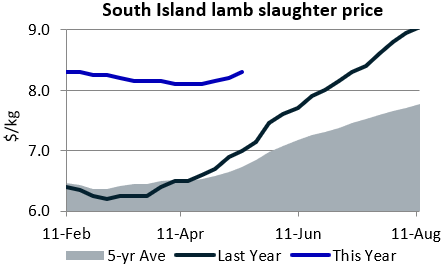 The latest slaughter statistics to March 9 show that the total lamb kill for both islands has reduced the gap between last years figures due to weeks of high killing numbers. The average carcass weight remains to be higher year-on-year with an average weight of 18.75kg. The latest wool sales in the North Island saw good levels of demand for lamb wool and good style second share wool, particularly from local buyers. In the middle of March, lamb wool micron 29 2/3 lifted 66c/kg to $6.05/kg, before easing at the end of March to $5.94/kg. The latest South Island sales had large offerings of end of season ewe and lamb wool. Most microns saw strengthened prices at the beginning of April with the market largely favouring sellers. Heartland Bank is proud to have teamed up with AgriHQ earlier this year to form a joint partnership. Together we were able to launch the AgriHQ Finisher Tool which was developed with the intention to make livestock buying decisions easier for farmers today. To read more about our partnership and the AgriHQ Finisher Tool click here. Commentary provided and written by AgriHQ and the opinions expressed in the commentary are solely those of AgriHQ not necessarily those of Heartland Bank. AgriHQ Finisher was developed to provide farmers with a way to calculate trading margin when buying store livestock. Interested in arranging livestock finance but not sure where to start? Contact one of our Rural Managers and they will be more than happy to help guide you through the process.